Durrell Wildlife Park (formerly Jersey Zoo) is a zoological park established in 1958 on the Island of Jersey in the English Channel by naturalist and author Gerald Durrell. It is operated by the Durrell Wildlife Conservation Trust. It has approximately 169,000 visitors per year, despite a lack of emphasis on large animals and its relatively out-of-the-way location. Jersey Zoo has always concentrated on rare and endangered species. It has mammals, birds, amphibians and reptiles, comprising over 130 species. Since 1964, the zoo has been home to the Durrell Wildlife Conservation Trust (formerly the Jersey Wildlife Preservation Trust).. The Penny Press have just installed a 4 die machine here, it is the first on the island. 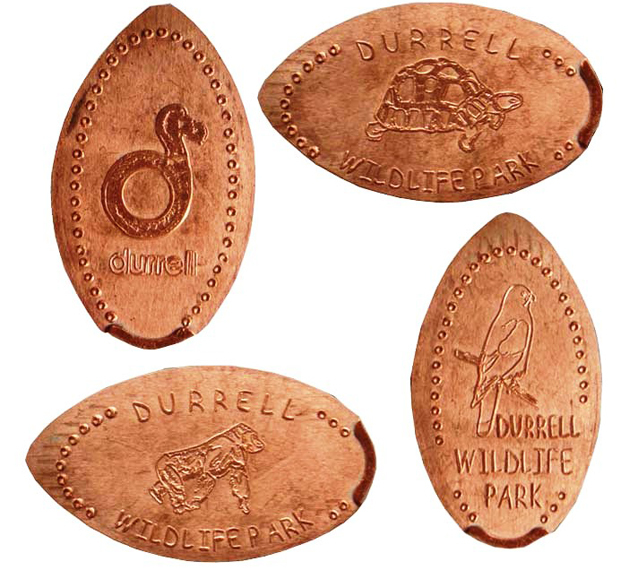 Each penny has a dotted border and Durrell Wildlife Park in text. They cost £1.